This is one of my favorite holiday traditions for real. There’s nothing more inviting than the smell of winter spices filling a home. Somehow it just makes me feel warmer, happier, and calmer all at once. The holiday season can be extremely stressful and good old-fashioned aromatherapy really does bring a sense of peace and calm to all that holiday mayhem. This is a recipe I use pretty often and it couldn’t be easier. I just set these ingredients in a slow cooker or directly on the stove top and let it work its magic. 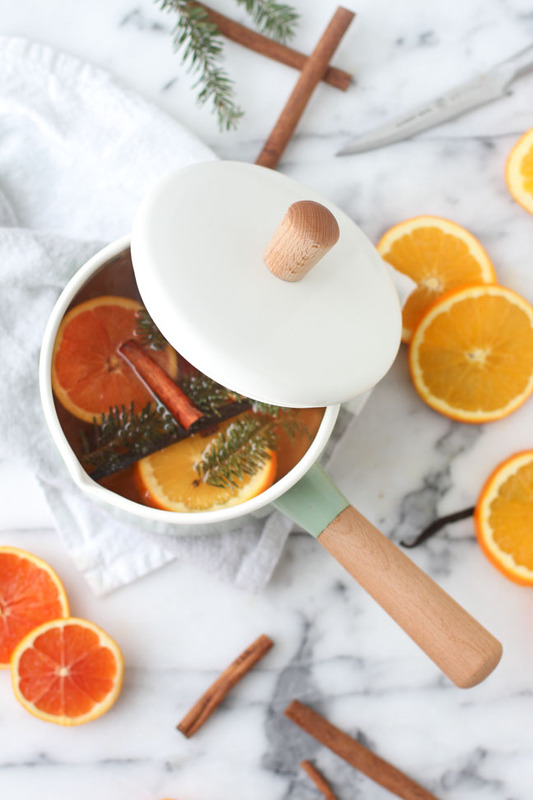 Just prepare yourself for the truly intoxicating aroma of citrus and winter spices to fill your home! 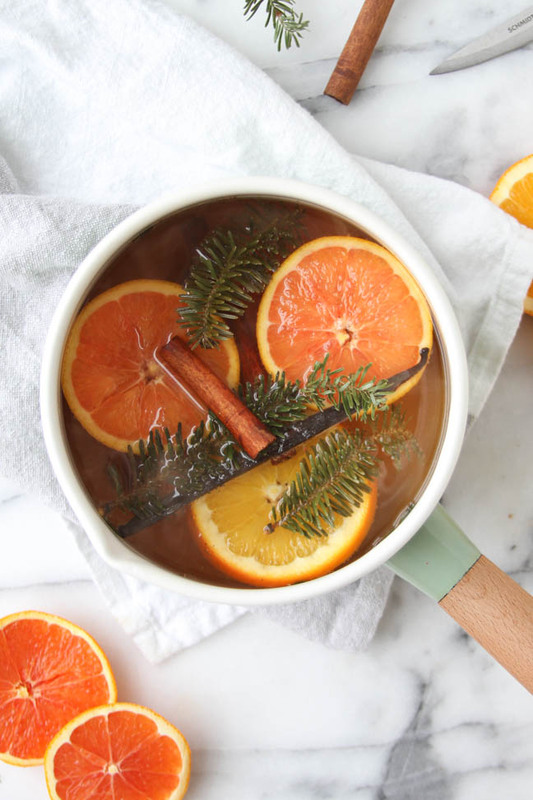 Pour apple cider into pot with a few sprigs of pine and the cinnamon sticks. Cut open the vanilla bean pod (or pods), lengthwise. Add to pot. Slice up the oranges into ¼ to ½ inch thick slices. Then, place them into the pot. Place the pot on medium high heat, until it reaches a gentle boil. Then simmer on low (up to several hours). Add water or more apple cider when the liquid in the pot begins to get low. If you’re using a slow cooker, just add all the ingredients and cook on high for the first 1-2 hours, then reduce the setting to low just as you would on the stove top. I can tell from here that the potpourri smells amazing. It is inspiring me to make some kind of Christmas beverage with blood oranges, like blood orange cider of blood orange Gluhwein or something. 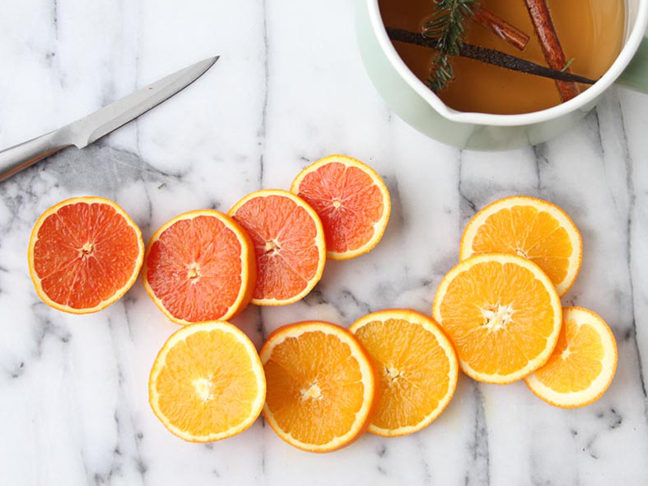 Can you imagine how pretty a blood orange would look studded with cloves? You are so right, Leigh! It’s fantastic and it totally does harken back to those traditional beverages you mentioned. 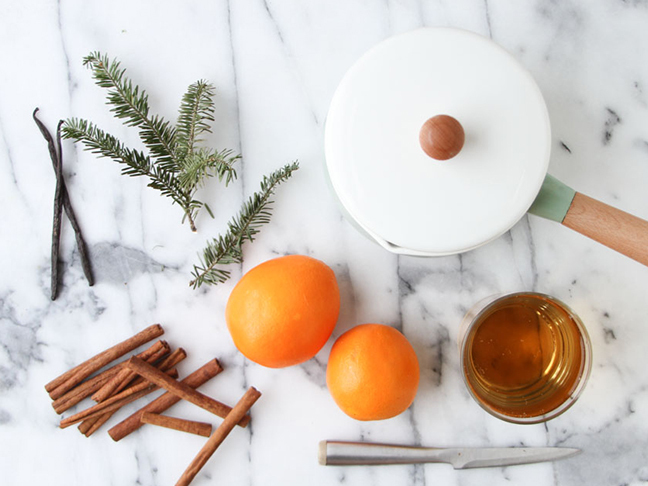 Also, I’m so going to make that blood orange pomander! What a great idea!